Celebrate the start of December with the kids! Events happening all weekend long starting Friday night including visits with Santa, parades, festivals, yoga, the Nutcracker Ballet and so much more. Join Louisville in its annual Parade of Lights. Enjoy musical entertainment provided by local schools & churches, a living nativity, petting zoo and visits with Santa. The Parade begins at 7:00 p.m. at the south end of Main Street and ends on South Street. The Parade of Lights will include the Louisville Arts District First Friday Art Walk. from 5-6:30PM. Enjoy choirs singing, the living nativity, visits with Santa, carolers, ice skating and lots more! All of Broomfield welcomes the arrival of Santa Claus at the George DiCiero City and County Building at the Holiday Tree Lighting Ceremony. Enjoy children caroling from the local schools, decorated Community Park trees, and the annual lighting of the community holiday tree by the Mayor. You can also ride the holiday wagon ride and talk to Santa. Bundle up and share in the Holiday Cheer! Erie is hosting its annual Country Christmas & Parade of Lights, featuring Santa’s Workshop, Local School Choirs, complimentary s’mores, living Nativity scene, free hayrides and a Parade of Lights followed by visits with Santa! Come to the Historic Callahan House for the Holiday Open House to tell Santa what you want for Christmas! Parents, bring your own cameras to capture the memories. The house will be open for tours as well so you have an opportunity to enjoy the holiday decorations. The public is welcome and admission is free. Cost: $20 VIP Reserved, $15 Adult General Admission, $10 Child/Student. Tickets available here. CenterStage Theatre Company presents Elf, Jr.: The Musical. Buddy, a young orphan, mistakenly crawls into Santa’s bag of gifts and is transported to the North Pole. The would-be elf is raised, unaware that he is actually a human, until his enormous size and poor toy-making abilities cause him to face the truth. With Santa’s permission, Buddy embarks on a journey to New York City to find his birth father and discover his true identity. Faced with the harsh reality that his father is on the naughty list and that his half-brother doesn’t even believe in Santa, Buddy is determined to win over his new family and help New York remember the true meaning of Christmas. Get into the holiday spirit this December with lots of free, fun and festive activities for the whole family every Friday at Village at the Peaks! 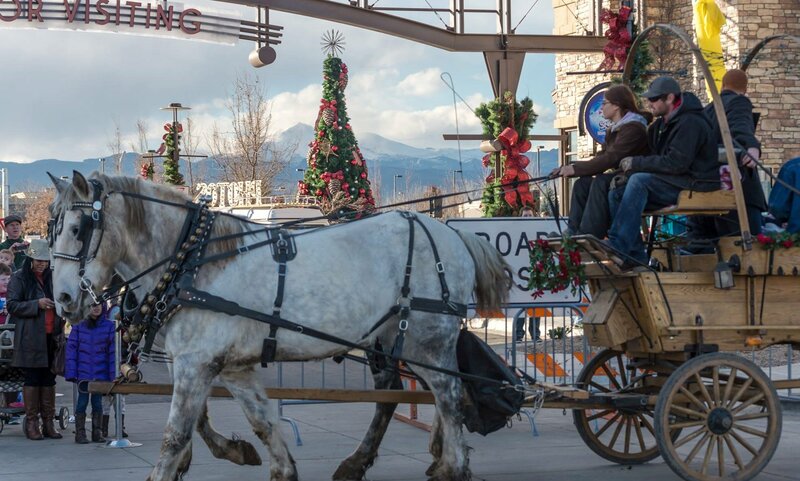 Jingle Bell Friday activities include: horse drawn carriage rides, kids crafts, face painting, and balloon artists. Stay for the carolers and cookies with Santa’s elves from 6-8 PM. The holiday festivities begin at the Superior Sports Stable for Superior Chamber’s Skate with Santa presented by Dixon Orthodontics. Come enjoy some time on the ice at the Sport Stable from 2:30-4 pm. We are collecting new coats for families in need so drop one at the door on your way into the event. Hot cocoa and cookies will be available as well as an opportunity to have your photo with Santa. Then head over to the Town’s Count the Lights holiday celebration at Asti Park 3:30-5:30 pm. Make a gourmet s’more, drink some hot chocolate, enjoy a horse drawn carriage ride around Original Town, tour the historic museum and enjoy holiday caroling by our local high school students. Cost: $5 per person, available at the door. A holiday tradition since 1972, Santa’s House is a community event hosted by the women of Boulder Area Alumnae Panhellenic for kids and families in the Boulder and North Metro area. Kids will enjoy meeting Mr. & Mrs. Claus, Christmas Bear & Puppy, and Mother Goose. Games with prizes, music and storytelling are also available – bring your camera to capture the magic of the holiday season. Proceeds benefit local charities Imagine! and EFAA. The bright glow of the holidays is once again coming to the Town of Lyonsfor the Lyons Holiday Bazaar & the Holiday Parade of Lights. The parade will start at 6:30 pm and will be filled with illuminated, colorful floats, many of which will be decorated in the theme of this year’s parade — “Peace on Earth”. Live music and entertainment will follow the parade at approximately 7:15 p.m. in Sandstone Park, on the Raul Vasquez Community Stage. Among those performing this year will be the Lyons High School and Elementary School Show Choirs. At 7:40 p.m., the sky will be illuminated by a fireworks display (thanks to generous donations & grants received from the Lyons Community Foundation and other local supporters)! Ages: 3 – 10 years. Adult must accompany child. Embark on an Under the Sea yoga adventure with CorePower Yoga in Broomfield! Come enjoy some time with your kids as we learn several basic yoga postures through a combination of story, play, and dance. Adult must accompany child / Suitable for ages 3-10. Space is limited. Call (720) 887-6191 to reserve your spot. Stop by McGuckin Hardware any Saturday in December to visit with Santa and his elves! Called Boulder’s “holiday mecca” by Leigh Buchanan of inc. Magazine, McGuckin’s has an amazing selection of everything you need to get ready for Christmas. McGuckin’s also offers workshop classes for kids throughout the holiday season. Enjoy live Christmas music from local musicians, and join in the holiday fun! Head downtown for Boulder’s annual tradition, the 30th Lights of December Parade. The parade features floats decorated by local businesses and organizations, as well as marching bands, fire engines, holiday carolers and of course – Santa! Join Boulder County and Trail Country Music Band for a night full of Christmas fun, crafts and dancing in the cowboy tradition! The event will be held in heated Barn A at the Boulder County Fairgrounds, in Longmont. Refreshments will be served. Join Santa in a free breakfast of coffee, juice, fruit and pastries at the annual Broomfield Lions Club‘s Breakfast with Santa. The Lions Club will host Santa as well as playing Christmas movies for the kids at the Broomfield Community Center Lakeshore Room. Join Lafayette for this free event, Home for the Holidays. The festival starts at 12:30pm and ends at dusk with the tree lighting and caroling. Visit with Santa and Jingles D. Checker, kids crafts, High Peaks Twirlers performance, caroling, and see the tree lighting. Come see Santa at Mountain View Fire Station, Erie Station 8. Share a cup of cocoa with us, write a letter to Santa and see the fire engines at Santa Station: Erie (Vista Ridge). Please bring a non perishable food donation to support the Mead Food Bank. Sponsored by Women’s International Niwot Club, Holiday Fayre with a British Flair features over 22 vendors selling a variety of items. One highlight is the bake sale of homemade cookies, cakes and so much more — including many British favorites rarely seen in our small town. Santa and Mrs. Claus will also be on hand to visit with the children, while hot cider is served by Niwot community youth. All proceeds benefit local charities. Visit Nederland’s Holiday Mountain Market, held the first weekend in December at the Nederland Community Center. In addition to photos with Santa, this annual arts and crafts festival features local mountain artists, unique gifts, festive food, a silent auction, and holiday music. Festival runs from 10AM – 5PM on Saturday, 10AM – 4PM Sunday. Photos with Santa 12PM – 3PM each day. Cost: $12 – $35, Tickets available here. The Nutcracker Ballet comes to Longmont, with the dancers from the Boulder Ballet and music by the Longmont Symphony Orchestra. One of Colorado’s major productions of the holiday tradition, with a cast of over 80 dancers including the professional company and charming young student dancers, a full live orchestra, spectacular scenery and special effects. Check out the Boulder Children’s Chorale performance of Songs for the Season at the Boulder Public Library. Experience some holiday cheer in this free performance featuring the four choirs of the Boulder Children’s Chorale.